If you are like many other drivers and families, then you are interested in driving a crossover or SUV. The Hyundai Santa Fe represents a spacious, versatile and value-priced option in the crowded crossover SUV space -- and one that car buyers should test drive! Whether you are shopping for a new or used vehicle, you can find a well-equipped Hyundai Santa Fe near the communities of Talladega and Tuscaloosa, AL at Jim Burke Hyundai. 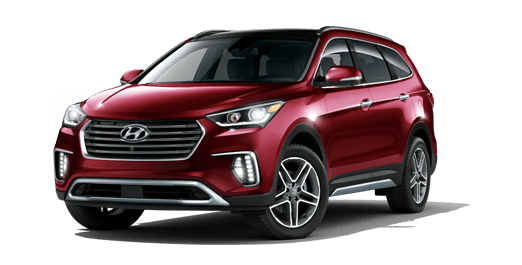 Shop the new Hyundai Santa Fe SUVs in Birmingham, AL now to find a Hyundai crossover or SUV that you would like to test drive. Continue reading to learn more about the features of Hyundai's popular 7-passenger SUV. Every new Hyundai Santa Fe SUV comes equipped with a 290-hp 3.3-liter V6 engine that delivers the capability and power needed to propel this fully-loaded 7-passenger SUV. A smooth-shifting and highly efficient 6-speed automatic transmission is also standard across the latest Santa Fe lineup and features Hyundai's SHIFTRONIC for shifting on-demand. For improved cornering abilities and greater traction in all road conditions, an Active Cornering Control All Wheel Drive (AWD) system is also available. The Santa Fe SE base model comes well-equipped with stylish 18-inch alloy wheels, while higher trim levels feature sporty 19-inch wheels that further improved cornering confidence. Drivers with active lifestyles and busy families agree: the Hyundai Santa Fe is highly versatile and a joy to drive. Its spacious cabin affords plenty of seating space and a cavernous cargo area. With split-folding rear seating, you can quickly convert the Hyundai Santa Fe from a family hauler to a cargo hauler in just seconds! Whether you opt for a shiny new Santa Fe or a late-model used one, you will get desirable features like spacious seating, multi-way adjustable front seats, 60/40 split-folding rear seats, Bluetooth wireless connectivity, cruise control and more. Amenities like leather seating, heated front seats, a large touchscreen display and Blue Link -- Hyundai's in-car connectivity system -- are all available on new and late-model Santa Fe crossovers. Shop the current inventory of new Hyundai Santa Fe crossover SUVs in Birmingham to find the very latest features offered on Hyundai's versatile SUV. For a detailed tour of Hyundai's latest Santa Fe SUV near Talladega, AL, bring your family down to Jim Burke Hyundai for a test drive. Our sales staff looks forward to showing you what makes the Santa Fe the smarter choice when shopping the 7-passenger SUV market. Our Hyundai dealership in Birmingham, AL is also home to a service department for future routine maintenance of your Hyundai. Shop at Jim Burke Hyundai for a great deal on an excellent new or used Hyundai!